So, what is your most powerful MOC character? In this topic we can share our most powerful characters. You don't need to show an image if you can't, or if the character is not finished yet. Here is mine: I haven't chose a name for him yet. He is suppose to be a huge titan, let's say twice as big as a Toa Metru (so around the same size as G2 Makuta). He should be part of a god-like species of elementals. I haven't chose an 'element' for him yet, but he would be a mad tyrant that would rule upon the others. His dream is to gather the Infinity Stones (yes they exist in my moc universe definitely not inspired by Thanos and to take over the planet of Spherus Magna, turning it's inhabitants in demonic slaves. TItle says most powerful Olmak Nuva is most powerful lol. I don't see how an Olmak can be Nuva. 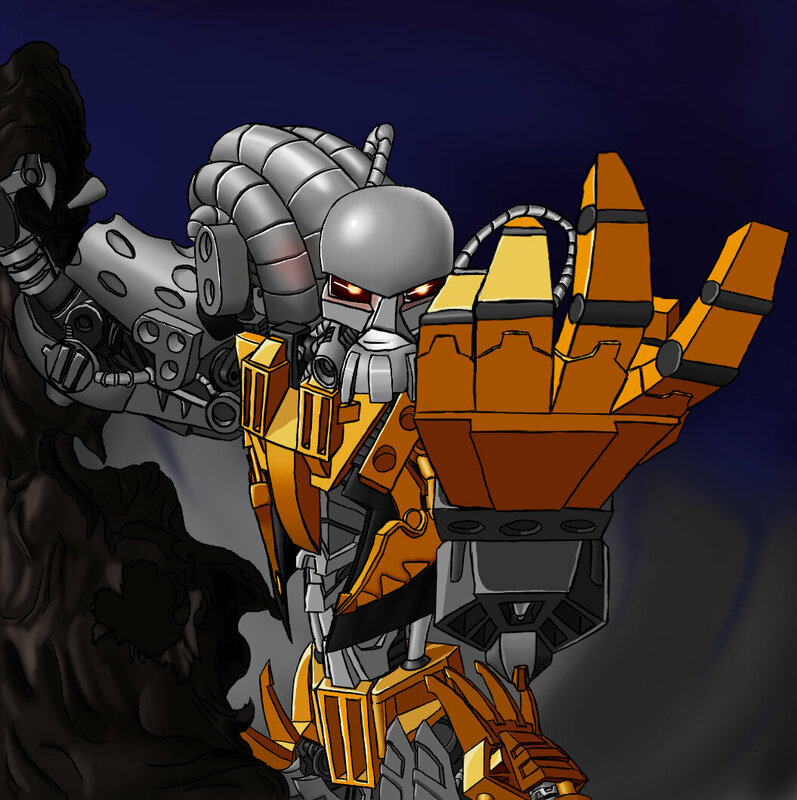 A Kanohi exposed to energized protodermis would become a Kanohi Nuva hence an Olmak exposed to it would become an Olmak Nuva. Just like the Hau, Akaku, Pakari, Kakama, Kaukau and Miru Nuva exsist. Mine are a tie between Podupo and Tiny Tekan. In truth the most powerful one I have planned is Reset, but that's less in terms of physical power/related than it is reality based power. I.e. While the other two are much more dangerous in terms of fighting he's much more dangerous in terms of effect on reality. A Toa of Air who absorbed the Mask powers of his teammates when they died, he now has a bevy of different powers, including Emulation, Dimensional Gates, Clairvoyance, and some others I haven't decided upon. They're not tied to his actual mask, and he can use more than one at the same time. A Toa of Iron named Xiana who has the mysterious ability to know things. While he has no control over this ability, and it usually gives him random knowledge, it will often give him information about his situation, such as the skills/weaknesses of an opponent. 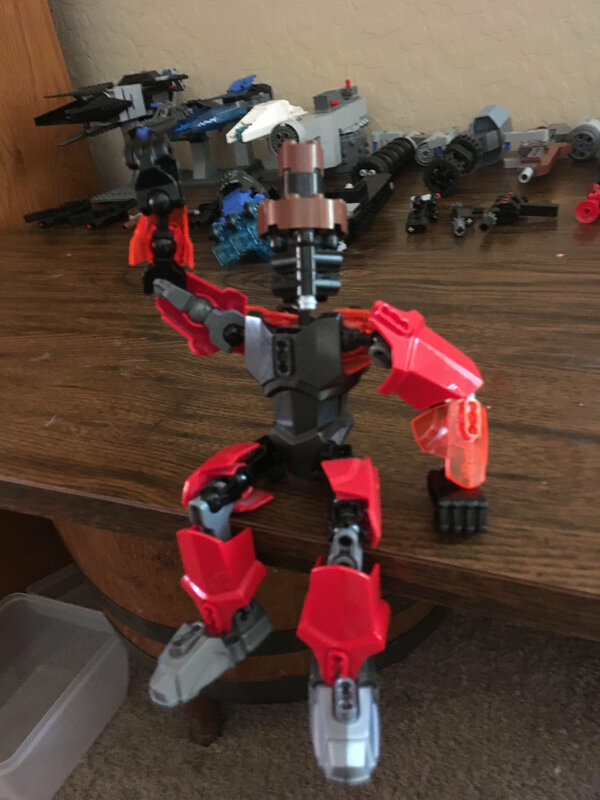 Xiana knows many secrets about things like the Order of Mata Nui, and as such has also shielded his mind. A mysterious shapeshifter known only as "Sue" (a name given to her by her 'owner' when she was disguised as an Ussal Crab). Sue is actually from another dimension, and her ability to manipulate certain types of energy is not very powerful in her home dimension but quite powerful in the Matoran Universe, since she can control the energy the MU inhabitants run on. She can take or restore memories, drain a person of energy and make them fall unconscious, and even steal Toa Power. She has to touch a target to use her power. Arguably my most powerful character is Nediam the Divider. She was my Aeonyx moc I made while those were still popular. If I get really technical, she's practically Monarth's grandmother. There are a couple. There is Mu'tah the god, so He had all sorts of powers when he was around, but since he's only a spirit now he has minimal impact on the real world. Pretty much only communication, however he did make Kardymis' sword. Then in terms of pure brute force, there's Parbold, who's pretty much a living artillery. Fighting him one on one would pretty much mean certain death. He will also be my next posted MOC, should anyone be interested. After that there's Serethus. OG board members may remember this character. He was a MOC I posted early on after joining the boards as a main villain. He'll be coming back in his third iteration in a few weeks/months. Anyways I'm bringing him back with a Thanos-ish story line, but rather than gathering certain objects powerful enough to halve the population, Serethus is gathering power himself, enough to wield a weapon capable of splitting the universe in two, or more, should they both survive the first. This gives him complete control over parallels and timelines and such, making him pretty strong. After all, if this weapon can split the universe in two, just imagine what it could do to a person. I don't know, a lot of my MOCs aren't god-like beings or anything like that. He was an entity composed of a Great Being that merged with an artificial Energized Protodermis called Quicksilver. He was very strong both physically and through his command over the substance. Here he is, this glorious piece of garbage which forever resonates as a staple of what not to do, ever. 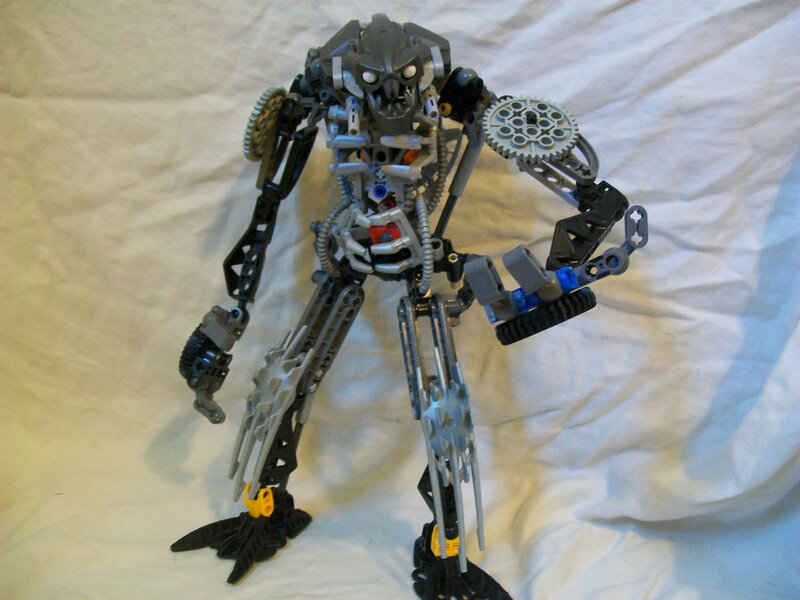 This is Ghidrax (Ghee-drahks) one of my first self-MOCs and a testament of bad building and no experience. Among his insane and beyond stupidly powerful abilities were the ability to generate and manipulate a boatload of lightning with little to no effort, unbelievably high heat resistance to the point where he could survive being launched into a star, and a pain resistance so great he was gutted multiple times by a harpoon sharp enough to slice through solid rock and he laughed it off. If ever I see a MOC more OP than this one or built even worse than this, I might be inclined to use the word 'Ghidrax' in my description of it. Isaac, because first is his knowledge, he knows more than any of my other figures because of how he's aware of that his world is the creation of others. Secondly with this knowledge of how his universe is a lie he uses that to his advantage being able to do what most others can't, teleport, walk on air/water, swim through land, freeze/speed-up time, and literally anything else you could imagine, he just doesn't use it that often or if at all because there's no fun in it, unless he's just using it to mess with people. Thirdly he has the most extensive and powerful weapon arsenals. For MoCs, it’s have to either be my self-MoC, Runa, due to his regenerative abilities, supersonic speed, ability to shoot and manipulate a green plasma-like energy, power to decay stuff, ability to create his weapon as many times as he needs, and his ability to power all these up to much, much higher calibers by releasing what is essentially an energy limiter, for only the trade off of some of his sanity and control; or it’d have to be Manopae, a spirit like thing that Makuta accidentally created with the MoUP, mixing its power with his jealousy and greed. He’s basically just the MoUP with a mind of its own. If we’re talking characters I want to make MoCs of, it’d have to be my Embodiment of Chaos, Hepohepo. His powers are essentially doing whatever he wants, usually by snapping his fingers. And although he can technically die, he comes back with the same body, pretty much the same personality, and the same memories, but the memories are to him almost as if they aren’t his own. Zurakia was a Great Being who was obsessed with war. He despised his brothers for "wasting" their resources on a useless, continent-sized robot, instead imploring them to focus on more pragmatic endeavors. This frustration led him to form a coup against his brothers- unbeknownst to him, his own creation turned on him, mortally wounding him and seemingly dead. Alone in the barren wasteland of Spherus Magna, he slowly rebuilt himself, becoming more powerful than any of his brothers could have imagined. Zurakia has abandoned his original body, creating a new one identical to the first in all but one way: this new body is made out of hundreds of thousands of tiny, microscopic cubes that can fuse together into a singular mass or act and move independently. These have the power of flight and can store a gargantuan amount of energy- combining into a practically limitless reservoir which each cube can release individually or coalesce and fire in a large blast from his palms. This energy can also be used to recreate cubes that may be destroyed in battle. Zurakia, through his studies, has developed an ethereal substance known as "Zurakian Energy" (often referred to as ZE). This substance allows him to completely control energy that comes into contact with ZE, which he can spread around him like a large, invidible cloud of influence. This means heat, kinetic, electrical, chemical, and even pure energy are completely under his control and can easily manipulate and turn enemy's attacks back on themselves. This ZE is strong enough that it can even cling to Zurakia in an aura, taking hold of the energy that makes up his atoms and acting as a shield. This aura negates any non-physical stimuli that Zurakia endures. This means many mask, kraata, rhotuka, or other miscellaneous powers are completely useless unless their effect is entirely physical. This technology is also used in his large, metal arm. This absorbs any retaliatory, opposite energy used to resist blows and simply adds it to its own outgoing force- essentially causing a chain reaction that causes anything that blocks his punch, instead, go towards making his punch stronger and stronger until it can no longer protect the target. 🏻 well done dude, did you do the art yourself?